Taste test: This smallish energy bar had a pretty good peanut butter taste. It was hard to notice the peanut butter taste on the first bite, but it grew an grew as I ate the bar. 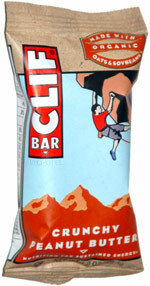 Some Clif bars that I ate in the past had a very gritty texture. The one was just slightly gritty, a big improvement. I'm not sure why the word "crunchy" is in the name, as there was nothing crunchy about it. Pretty good choice if you don't want one of the regular-size energy bars. Smell test: Soft of peanut buttery.